The introduction of Liquid KarmaTM represents a major and significant breakthrough in plant nutrition. This is because Liquid KarmaTM contains a full complement of metabolically active organic compounds not found in regular plant foods or supplements. These unique compounds are absorbed immediately and act as regulatory signals, activators or catalysts to produce synchronized and accelerated growth under all conditions. Liquid KarmaTM functions as a growth engine because its high metabolic activity produces a large amount of energy which is immediately transformed to growth. A. Fermented Compost Solution - prepared by exhaustive bacterial and enzymatic fermentation of fish meal, composted seabird guano, spirulina, sea kelp, and soybean meal. In order to enhance the fermentation process and obtain a product which contains the highest possible biological activity, the fermentation is carried out in different stages in the presence of humic acid, citric acid, raw sugar cane, complex carbohydrates, glucose fructose and over 72 trace elements. Fermented Compost Solution prepared in this manner is used by an increasing number of organic gardeners to obtain luxuriant vegetative growth, huge flowers and flavorful fruits and vegetables. B. Amino Acids - Liquid Karma contains essential amino acids which are derived from casein hydrolysate and soybean protein hydrolysate. Amino acids are important plant nutrients because they serve as building blocks for structural proteins and enzymes. In addition, amino acids are also involved in the activation of transfer ribonucleic acids (t-RNAs) and DNA synthesis. The following amino acids derived from casein hydrolysate and soybean protein, are present in Liquid Karma: glycine, alanine, valine, leucine, isoleucine, serine, threonine, aspartic acid, glutamic acid, aspartic acid, glutamic acid, asparagine, glutamine, lysine, arginine, histidine, cysteine, cystine, methlonine, proline, phenylalanine, tyrosine, and tryptophan. C. Vitamins - All of the vitamins used in this formulation are extremely beneficial for plant growth because they function as co-factors for enzymes involved in carbohydrate metabolism and the biosynthesis of macromolecules. Liquid KarmaTM contains significant amounts of riboflavin, thiamine, pyridoxine, and all of the other B-complex vitamins obtained from fermented yeast extracts. 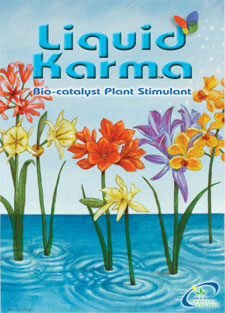 D. Plant Extracts - Liquid KarmaTM also contains aqueous and ethanolic extracts of etiolated wheat seedlings and Zea mays. These extracts contain high levels of the plant hormones known as auxins and cytokinins. For successful plant micropropagation (tissue culture), the crucial requirements for an auxin and cytokinin are well documented in botanical literature. An example of the beneficial effects of using Liquid KarmaTM in tissue culture is shown in Figure 1. E. Humic Acid - In addition to the ingredients indicated above, Liquid Karma contains optimal levels of humic acid derived from leonardite. This substance is known to stimulate the growth of roots, shoots and flowers, by maintaining the proper osmotic concentration in cells. F. Seaweed Extract - Liquid KarmaTM also contains a high proportion of seaweed extract obtained from North Atlantic Kelp (Ascophyllum nodosum). Kelp extract contains metabolically active carbohydrates, complex carbohydrates, minerals such as cobalt, strontium and iodine, and growth substances that are known to be beneficial for plant growth. G. Carbohydrates - Carbohydrates are included in Liquid KarmaTM because they are the direct or indirect precursors of virtually every metabolite. Their precense provides the added burst of energy required to assimilate and metabolize all of the other wonderful ingredients present in Liquid KarmaTM. The seven nutrient groups used in the formation of Liquid KarmaTM act synergistically to produce optimal plant growth. Extensive research and field trials indicate that Liquid KarmaTM produces beneficial results during every phase of plant growth. Starting with seed germination and following through to vegetative growth, budding and flowering, the continued use of Liquid KarmaTM ensures optimal plant growth at every stage. In addition, because of the presence of high concentrations of B-complex vitamins and plant hormones in Liquid KarmaTM, the product has been shown to be very effective in protecting plants from transplant shock, and in promoting the rooting of cuttings.